Since 2000, the United States has seen reported cases of potentially fatal Legionnaires’ disease grow by almost 4.5 times (1). CDC states that there are now between 8,000 and 18,000 cases of Legionnaires’ disease in the United States every year, and that 10% of these cases result in death (2). Scientists say that a mix of factors, such as climate change, our aging population, infrastructure and improvements in testing, diagnosis and reporting could all contribute to this rapid increase of infection (3). What is disturbing however, is that with effective water management, this deadly illness is completely preventable. What Guidance and Regulation Covers Legionella Bacteria in Water System? In the US, the Environmental Protection Agency’s (EPA) Safe Drinking Water Act has a stated Maximum Contaminant Level Goal (MCLG) of zero organisms for drinking water (4). However, this guideline is non-enforceable (4). It also ignores all non-potable water systems with the ability to harbour and spread Legionella bacteria. For this reason, the ASHRAE 188 Standard is more commonly referred to by professionals who want to manage their water systems safely and prevent the growth and spread of Legionella bacteria. This document is aimed at any persons involved in the operation, maintenance, commission, design or construction of a facility, as well as any building managers or owners (5). And provides an industry wide minimum for acceptable performance. ASHRAE 188 addresses the types of systems, devices and facilities which need a water management program; what should be the components of that program; who should be on the water management team and how often these plans should be reviewed and updated (5). The document states that a water management plan should be implemented for any building which has devices which create aerosols, or release fine water droplets, such as cooling towers, ornamental fountains, whirlpool spas, misters, air washers and humidifiers. Section 5 of ASHRAE 188 also states that a building survey should be carried out to determine any increased risk from multiple housing units, healthcare facilities or the presence of elderly or vulnerable persons (2). Document all procedures and maintain records (2). How any water is received and processes within the system/ systems (2). Detailed process flow diagrams of the systems/ systems should also be drawn up, to facilitate easy identification, analysis and management of Legionella risk for each step of the process2. It is the program team’s responsibility to ensure that these are accurate and up to date. These process flow diagrams can then be used by competent individuals to identify risk areas in the system and what control measures should be applied and where (2). The vulnerability and susceptibility of individuals should be considered during this process. The information that has been gathered can then be used to write up provisions in response to any service disruptions (2). Once you have mapped out and properly assessed the severity of your various risk areas you should start to determine appropriate control measures and how these should be maintained and monitored. Any physical design and equipment siting for the control of disease and any treatment methods, technical and physical processes, procedures activities and actions that maintain the safety of water conditions, as well as where and how often these should be carried out, should be mentioned (2). The means, method and frequency of monitoring activities should be clearly stated and maintenance logs, electronic readings and reports and BMS outputs and records should be filled out and kept where appropriate. Out of spec control measures should be identified so that responsible persons are aware of when corrective action should be taken. The program team must also identify who is responsible for corrective action should Legionella, or any other life-threatening problem, be found within the system. The required response time and a list of persons to be notified should also be clear (2). This program plan should be accompanied by an appropriate implementation plan and should be updated and revisited when necessary, especially when sources previously used have become outdated or there have been significant advances in technology – in the rapid testing sector for example. When considering regular testing there are a few things to consider. First of all, are the control limits consistently within the specified control limits? Are there vulnerable persons in and around the facility? Does the system have a previous history with Legionellosis? If no, no further action may be needed. But if the answer is yes sampling and testing is highly recommended. The contents of your water management program and your assessment of the risk should inform the approach to testing, the sampling frequency, the number of samples taken and their locations. Alternative testing methods can provide an early warning of a potential problem and allow a fast response. If Legionella pneumophila is present in the system, it is inadvisable to wait two weeks to find out if people are being exposed to a potentially fatal infection. While carrying out laboratory culture tests might ensure compliance with the regulations, it can also be argued that not all reasonable measures have been taken to prevent an outbreak given the availability of the alternative testing methods. If presence of Legionella in the system resulted in a fatality, it could be seen as negligence for not using an available, faster test. This innovative technology has been optimised to quickly detect cell surface Legionella antigen in all kinds of environmental water samples. The test is designed to be highly specific for Legionella pneumophila serogroup 1 - the species of Legionella which is responsible for 70 to 92% of laboratory-detected Legionellosis cases in the United States and Europe (2). The recovery rate of 80% in rapid-antigen testing is better than the lab culture method, which is typically 10-60% (6). It also detects the viable but non-culturable (VBNC) and the motile phase of the Legionella pneumophila, which are the most virulent phases and cannot be detected by the lab culture method. time saving and improved water quality. Hydrosense reduces public and employee health risk by minimising the time taken to identify Legionella bacteria and capturing results for ongoing verification and risk management requirements. In parallel with periodic lab testing, or as a stand-alone method, this simple test allows organisations to maintain vigilant control on water system quality. The test improves detection rates of Legionella bacteria and provides results, on-site within minutes. 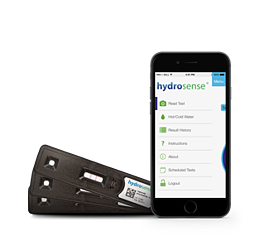 Further result verification is provided by Hydrosense smartphone reader and portal. 1. Cdc.gov. (2018). Legionnaires Disease and Pontiac Fever | For Media | CDC. [online] Available at: https://www.cdc.gov/legionella/qa-media.html [Accessed 27 Aug. 2018]. 2. Graef, P. (2015). ANSI/ASHRAE Standard 188-2015 Legionellosis: Risk Management for Building Water Systems. [online] Ordemengenheiros.pt. Available at: http://www.ordemengenheiros.pt/fotos/dossier_artigo/conferencia_oe_ashrae_dl_patricia_graef_lisboa_11jan2018_19749348975a5e19f5aef16.pdf [Accessed 27 Aug. 2018]. 3. Rubin, R. (2018). Why Are Legionnaires Disease Diagnoses Becoming More Common in the United States?. JAMA, [online] 319(17), p.1753. Available at: https://jamanetwork.com/journals/jama/article-abstract/2678443 [Accessed 27 Aug. 2018]. 4. Epa.gov. (2000). LEGIONELLA: DRINKING WATER FACT SHEET. [online] Available at: https://www.epa.gov/sites/production/files/2015-10/documents/legionella-factsheet.pdf [Accessed 27 Aug. 2018]. 5. Cdc.gov. (2016). Legionnaires Disease ASHRAE FAQs | Legionella | CDC. [online] Available at: https://www.cdc.gov/legionella/health-depts/ashrae-faqs.html [Accessed 27 Aug. 2018]. 6. IWC 2008 - Neil Polwart, Ross Grant, Howard Barnes, Eric Holmes, Tom Lindley and Andrew Cooper- A Field Test for Rapid Detection of Legionella pneumophila serogroup 1 in Water Samples.